Sometimes called Comet, this vase has a ring of stars around the top, each sitting on a spiked set of rays. 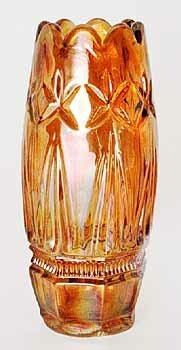 Originally thought to have been made by either of the Czechoslovakian glass manufacturers Inwald or Rindskopf, it is now credited to the Polish maker, Hortensia. It is known in three sizes and only in marigold. Two 8-inch examples sold in 2000 for $17 and $350. In 2007, a 6-inch example sold for $225, and in 2009 an 8 1/2-inch vase brought $90.